Foto Friday CXXVII – ..:: NJ Brideau ::.. This picture has many object that I like: a lamp post, bird, fishing boat, love locks stuck to a bridge (n.b. I only liked the ones on Pont de Arts in Paris), rolling hills, and haze over the bay that looks orange because of the setting sun. I also like this picture because Mafalda and I were standing in similar places, each with a camera, and we managed to frame it differently. 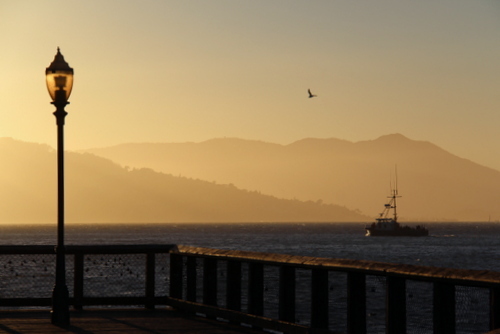 This was taken from a small pier in Fisherman’s Wharf, San Francisco during our trip to the USA. The fog was stronger than I expected, but this day I really liked the color it turned.